I’m not sure how many people are aware of it, but Protaetia orientalis (Coleoptera: Scarabaeidae) – the oriental flower beetle, is established in Hawaii. I occasionally see it buzzing around the Pearl Harbor area. In flight it looks a lot like a female carpenter bee. I actually set out some traps for this beetle a couple of years ago on base (Makalapa compound) – perhaps I’ll write about that another day – but I didn’t have a lot of success. I also have some experience with this little guy on Guam. For now I’ll just post some pics from an encounter in 2002. This was before my time with Navy and involves my predecessor and mentor, Stan Higa. 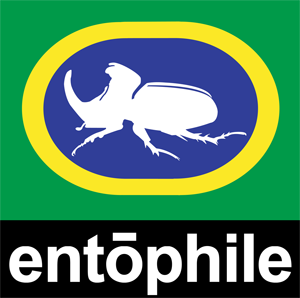 The golf course superintendent at Mamala Bay (Hickam AFB) asked Stan to go out and look at an African tulip tree on the 9th hole that was infested with a large scarab beetle. Stan checked it out on Nov 6, 2002, took some pictures, and collected some specimens. Bernar Kumashiro at HDOA identified the beetle as Protaetia orientalis. I’m not exactly sure what happened after that, but I think it was determined that the infestation was limited to that particular tree and treatment they didn’t find any more beetles in the area. Not sure how much monitoring they did in the area or for how long. I think I remember Bernar saying that there are other records of this species being found in Hawaii. Anyway, below are the pictures that Stan took of this particular incident. We found one 10/22/09 turned it in to HDOA for identification. Yeah, we also see this species all the time in Manoa, so it’s well established. People frequently bring them into the Insect Museum at Gilmore wondering what they are. I’ve recently seen them in Kailua also. Do you know if anyone has written a note about this in the PHES? It’s something I’ve been considering for a while but never seem to get around to doing. Hi Rick, thanks for the heads-up on the tree ID. I’ll look into it. Also if there are any botanists out there that would like to chime in, please feel free to do so. Unfortunately, It would not be the first time I had sometthing misidentified on this blog. That’s a Geiger tree, Cordia Sebestena, in the photo, not a native kou tree. Thanks for the ID – it is much appreciated! I live in Ocean View, on the Big Island of Hawaii, and have, for the first time found 5 of these beetles in my kukui tree. I have never before seen them here. Thanks for the comment – Yes, unfortunately they seem to be becoming more common throughout the State. I live in Kuliouou and have a small garden including a couple beds of corn. These beetles love my corn plants and I have killed at least 30 of them in the past month. I remember when I was growing up in Kaimuki that these beetles also came when we had corn plants at my parents house. Yikes! One of my tomato plants is crawling with these things. I have never seen them before here in Makakilo, but judging from earlier posts, it seems they have moved in and are spreading. Sorry, but they have got to go–I welcome lots of insects and creatures into my garden, but I draw the line on these hideous things. I don’t suppose there is an organic way to get rid of them? Oriental Flower Beetle from Hawaii | What's That Bug?